There’s a reason someone coined the term “beauty sleep”: During our REM cycles is when our body repairs, healing itself from the inside out. That’s why even if we miss one good night’s rest, we can wake to find our faces looking sallow, puffy and dull. While there’s not a cure-all for skipping out on precious snooze time, there is a way to promote faster, more complete overnight restoration to our skin. OBC skincare’s Nourish Night Face Oil is formulated with skin-boosting, plant-based oils and ingredients that are designed to bring out your natural glow while you sleep. Nourish’s most prominent ingredient, organic prickly pear seed oil, is a big up and come-er in the healthy beauty world. You might have heard of it by a number of names (including cactus pear oil and barbary fig seed oil), but they all equate to the same skin-healer. It’s one of the most expensive on the market because of its properties: Its seeds, when cold-pressed, release an anti-inflammatory, blemish-busting (from its high zinc content), glow-restoring oil that softens skin with vitamin E and reduces dark undereye circles with vitamin K.
But prickly pear seed oil isn’t the only powerful ingredient in Nourish Night Face Oil. Organic Bath Co. includes a calendula-and-chamomile-flower-infused jojoba oil in Nourish. Organic jojoba oil most closely resembles the skin’s natural sebum, which allows for deep penetration into your pores and helps balance all skin types. Calendula and chamomile both have long-heralded skin calming properties that reduce inflammation and soothe irritation. They can help decrease puffiness and redness, and have stress-reducing scents that are perfect for a pre-bedtime ritual. Nourish also contains a skin hydrating and balancing blend of organic shea nut oil, rosehip, tamanu and evening primrose. If you’ve spent any time researching plant-based oils, you know that each of these has incredible skin benefits. Shea nut has a thicker consistency, and is great at serving as a barrier to harsh climates and the elements. It also soothes extreme skin dryness and irritation while helping to heal dermatitis and eczema. Rosehip oil has the unique ability to benefit all types of skin. It’s considered a “dry” oil, which means it soaks into skin instantly, leaving a radiant glow behind. It’s extremely high in essential fatty acids and is recognized by beauty gurus and medical journals alike as wonderful at treating damaged, dehydrated and irritated skin. Thanks to high levels of vitamin A and C, rosehip oil repairs skin damage, fades scars and hyper-pigmentation, and softens fine lines. Tamanu oil is one you might not have heard much about, but its properties are too great to ignore. It packs the most punch against healing damaged skin, including blemishes, wounds, rashes and scars. It’s very thick in nature, and only a small amount is needed to reap its benefits. It also adds to the caramel-y scent that Nourish leaves on your skin. Evening primrose oil, yet another ingredient with multiple skin benefits, contains one of the highest concentrations of the fatty acid gamma-linoleic acid (GLA), which is mainly responsible for evening primrose’s healing properties. GLA is essential for cell structure and skin elasticity, making evening primrose perfect for treating aging skin. It can also help repair skin irritated by eczema, blemishes or rosacea. Nourish Night Face Oil also contains organic hemp seed oil, another light-but-mighty oil that treats redness and irritation with omega-3 and omega-6 fatty acids. It also helps maintain your skin’s natural lipid barrier, holding in water and moisture that your skin needs during the dry, cold winter. Green coffee oil firms and tightens skin, giving it a bright, plump look. While I love all the properties of Nourish and have seen a visual difference in my skin’s clarity, redness and glow since using it, my favorite part of the oil is its scent. I already mentioned that tamanu oil gives it a caramel-y flavor, but organic vanilla and lavender add to it, making it stress-reducing and slightly sedative. Creating a nighttime ritual that includes massaging this oil into my skin each evening was easy because I know it not only enhances my skin, but it also prepares my mind and body for good, solid sleep. 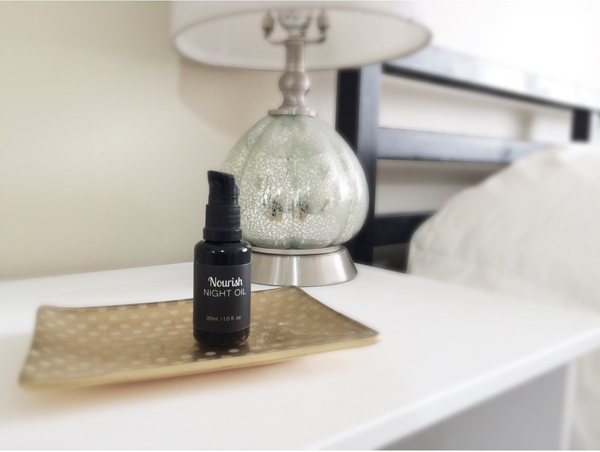 Have you tried Nourish Night Face Oil? What kinds of rituals do you have to help your skin repair while you snooze?